2013 has been a fabulous year for me with lots of opportunities for travel. I was lucky enough to visit Spain, Italy, Greece, Turkey, Thailand and South Africa, all in less than eight months. Of course, I was also lucky enough to be based in London when I wasn’t in one of these other fantastic countries. There’s always something happening in London. This vibrant city has been my home for over 28 years (yikes, that makes me feel ancient), and while some of the old favourites remain, there’s always something new and exciting to try. So I couldn’t resist the opportunity to tell you about the best dishes I’ve eaten this year from a select 10 of London’s restaurants that I visited, spread throughout what’s arguably the best city in the world. Here they are, in no particular order – there’s no chance I could rank them…sorry! Enjoy the lovely pictures, I guarantee they’ll get your mouth watering. Whatever type of cuisine you’re looking for, London will have something to offer. This year saw quite a trend in South American restaurants popping up all around the capital. Zoilo is Argentinian and opened early this year. 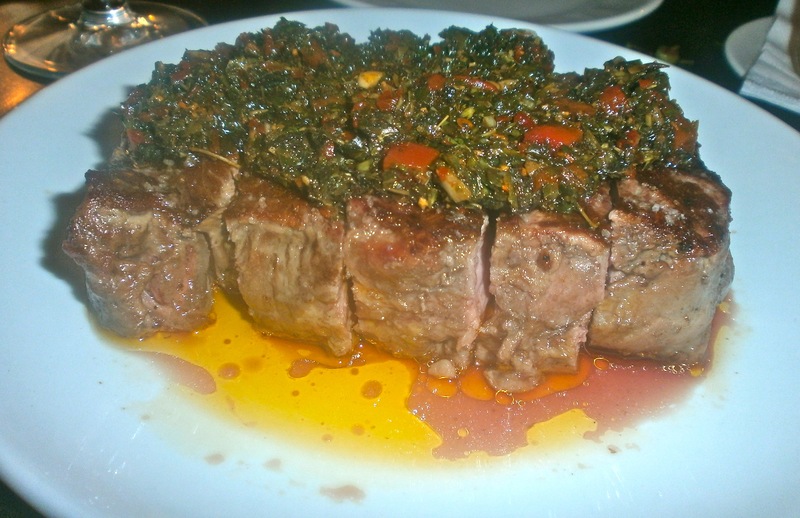 I went there in May and tucked into what was definitely my best steak of the year. So favoursome, so tender, so perfectly cooked and topped with an amazing fresh, zesty and spicy sauce. This is a steak no meat lover should try to resist. Heston Blumenthal’s Dinner restaurant opened in Spring 2011. This year it was awarded its second Michelin star and is ranked at no. 7 in the San Pellegrino Worlds 50 Best Restaurants. I’m not a huge Heston fan, having found lunch at The Fat Duck more like a science experiment than a meal. But having developed serious feelings of inadequacy upon reading the said San Pellegrino list I decided as Dinner was close to home I simply had to pay it a visit and up my tally of top-50s visited (if only by one). I loved Dinner – the food, the service, the space, the whole experience. Lunches are great value at £38 (it was £36 when I visited in May) for three courses – but it seems impossible not to get a serious wallet-draining hit with the wine! Oh well, sometimes you have to throw caution to the wind. 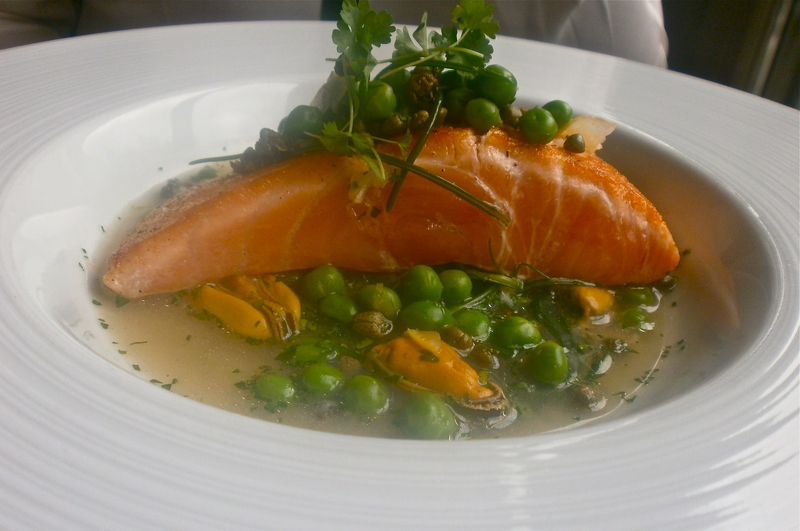 The best dish of the day was this beautiful cured salmon with monks beard, peas, caper and mussel broth. Dinner is in the Mandarin Oriental Hotel in Knightsbridge (across the road from Harvey Nichols), overlooking Hyde Park. Another trend for 2013 in London was the appearance of more and more Parisian-style brasseries. I love this kind of simple food, cooked perfectly, so bring on the brassieries. Brasserie Zedel opened late last year in the space that used to be the Atlantic Bar and Grill. How I loved that place, it felt the ultimate in sophistication at the time. So I started from a good place mentally, walking in feeling happy to be descending the grand spiral staircase once again into the buzz and clatter of brasserie life. The menu offers a decent range of classic French dishes and it’s such fabulous value for money, you actually can’t believe it. The space is grand and imposing while also feeling welcoming, transporting you instantly across the Channel. 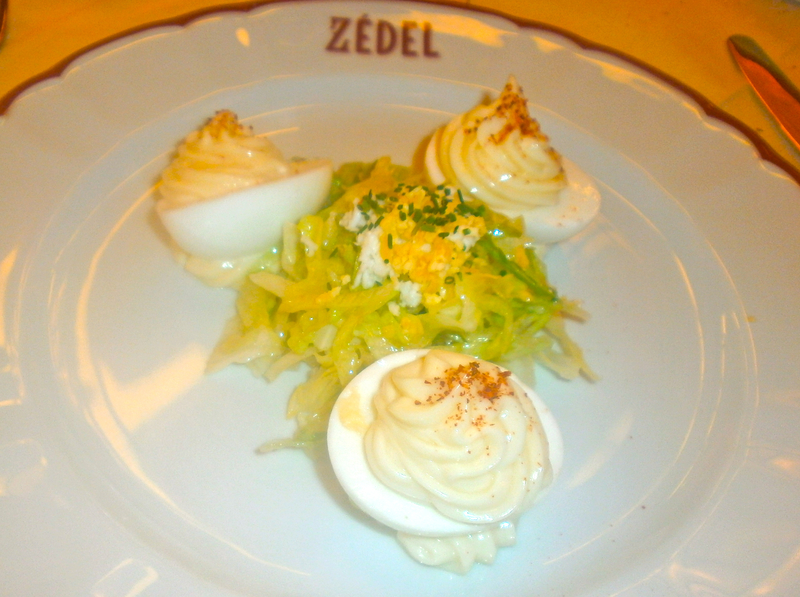 I’ve recommended Zedel a lot this year and everyone’s had a good experience. My starter – the humble egg mayonnaise was as perfect as can be. The lightest, tastiest mayo ever and a crisp pile of lettuce in the middle sprinkled with more chopped hard boiled egg. My blog was conceived of and started in Covent Garden, so I was very excited when glamorous Covent Garden favourite, Christopher’s reopened in May this year after serious renovation. One of the very first American restaurants in London, it originally opened in 1991. The beautiful listed building is now home to a stylish Martini bar on the ground floor and an elegant dining room on the first with huge picture windows looking out over Waterloo Bridge. A classic view to make anyone proud to be a Londoner. 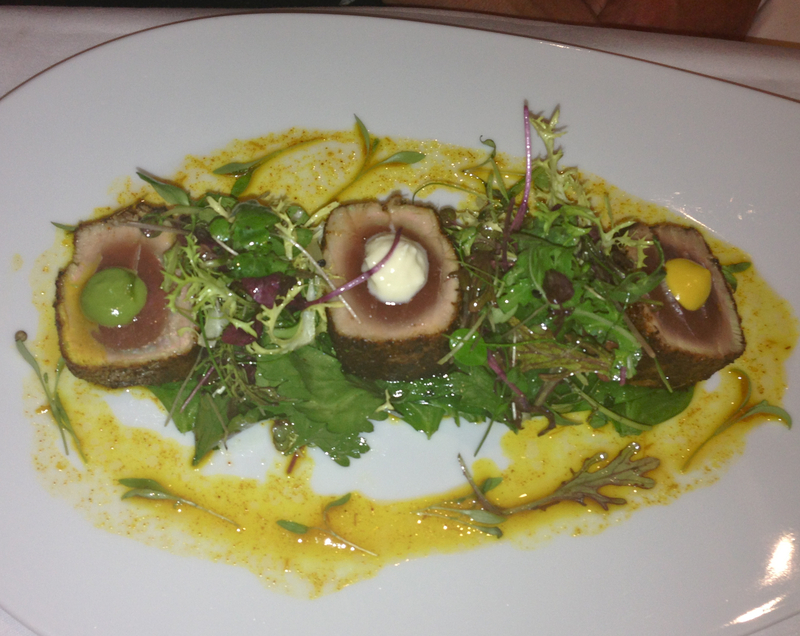 The modern American cuisine is beautifully done and this tuna dish is definitely the best tuna I had all year – and I eat a fair bit of tuna. If you’re after a bit of glamour, a touch of history and some seriously good food, you can’t go wrong with Christopher’s. Christopher’s is at 18 Wellington Street, WC2. Next stop and it’s somewhere completely different. A laid back, neighbourhood Vietnamese in Fulham, Orchid Vietnam Kitchen…what did I say, the variety in London is amazing. My first visit to a Vietnamese restaurant, although I’ve cooked a lot of Vietnamese dishes as I love the freshness of all the herbs they use and the simplicity of a lot of the dishes. This night was like a tour of the country with dishes and tastes from different regions. 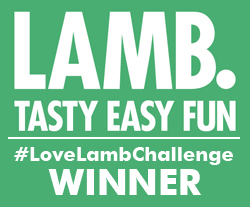 The winner was the Monkfish Cha Cha La Vong. Monkfish marinated in galangal and saffron, brought in a frying pan and cooked at your table with handfuls of fresh dill and served with more herbs, veggies and rice. 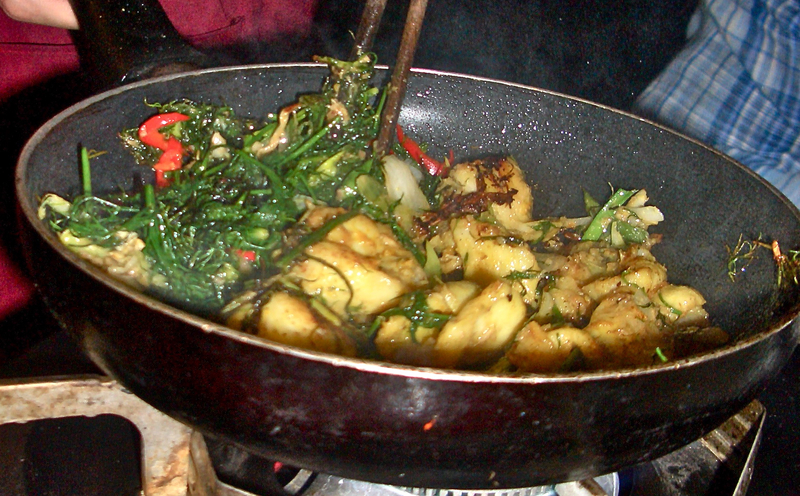 Such a wonderful dish, and the food we ate and people we met got me seriously thinking about planning a visit to Vietnam in 2014. The Social Eating House, in the heart of Soho, is the third London restaurant from British chef, Jason Atherton. I love exploring Soho and was lucky enough to work there for seven years. It’s food and drink heaven and here’s a welcome new addition. A wonderfully glamorous space with an intriguing menu. My starter of mushrooms on toast was pure genius. 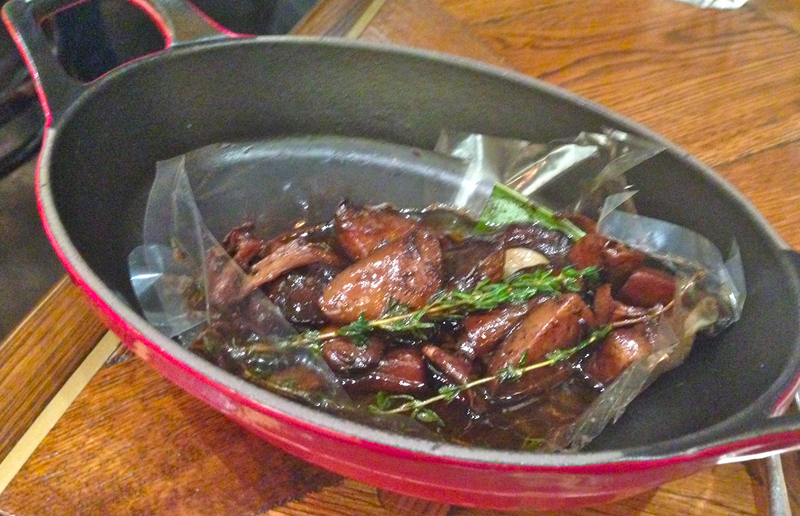 The earthy, wild mushrooms arrived bubbling in a sealed bag which the waitress then snipped the top off. The toast arrived in a little toast rack and was spread with a cep puree which added such depth to the dish. Clever, simple, fun and so delicious, who knew mushrooms on toast could be so delicious! The Social Eating House is at 58 Poland Street, W1. It was awarded a Michelin Star shortly after I visited. Another day, another Michelin Star restaurant. Set on a side street (the same one as The Ivy) on the edge of Covent Garden, La Cuisine @ Joel Robuchon also offers brasserie-style food in a bright, modern dining room. Their set menu is good value at £50 for three courses, including wine pairing with starters and main courses. There’s also a lovely roof terrace where we enjoyed post-lunch drinks on a balmy September afternoon. It was hard to drag ourselves away. 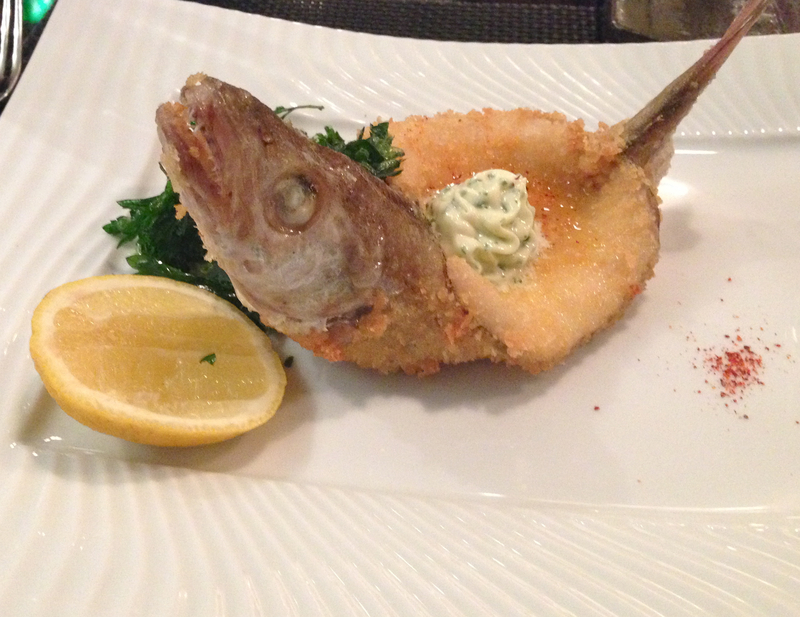 The dish I’ve chosen was my main course of Whiting. Light and tasty with a luscious helping of melting butter, dishes don’t get more typically Parisian than this. Something completely different. La Cuisine is not cheap, which makes it a lovely place to really treat yourself and take your time over a long, leisurely lunch. I spent a large part of the summer working in the Southwark area in London, right next door to a very noisy building site (sorry for the tautology). Turns out it was the development of the latest Gordon Ramsay offering in London, The Union Street Cafe. Rumour had it that David Beckham was involved in the venture and pre-opening, online booking went bonkers. After opening it emerged he wasn’t…not sure what that was all about? Why people would want to go to a restaurant more because Beckham is involved is a bit of a mystery, it’s not like he’s going to be there every night! I went along in the first couple of weeks it was open and really liked the place. The modern warehouse-style space lends itself well to the modern Mediterranean food, the service was relaxed, friendly and efficient. 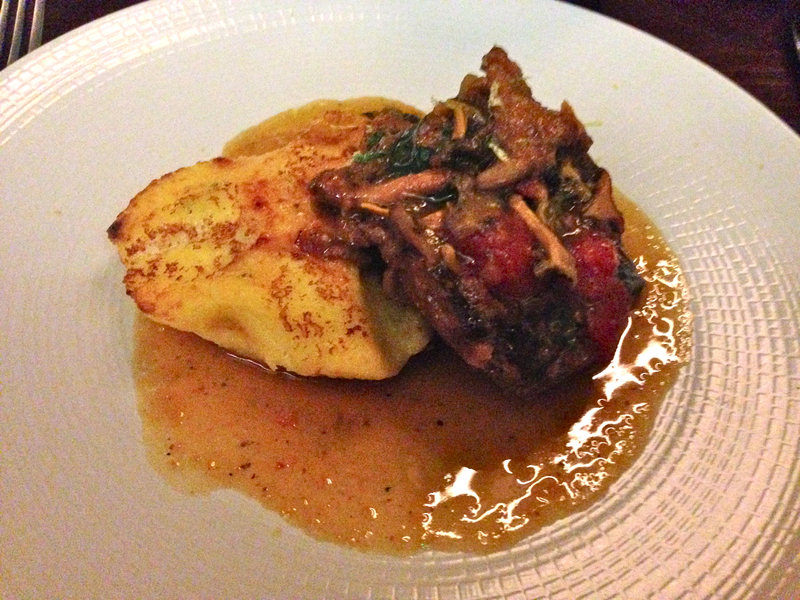 My main course of lamb neck with polenta was melt-in-the-mouth. Some anti-Ramsay critics gave it a bit of a bashing, he does suffer from negative press just for being Gordon Ramsay…not terribly open minded. I’d certainly go back. One of the many great things about London is that it’s packed with beautiful parks. You’re never far from an open space to relax in and get away from the hustle and bustle of the city. So imagine my delight when I heard of a new restaurant opening in Hyde Park in November this year. The Magazine’s building was designed by famous Iraqi-British architect, Zaha Hadid, who designed the Aquatic Centre for the London 2012 Olympics. It’s modern, bright and really quite stunning with a lovely menu. 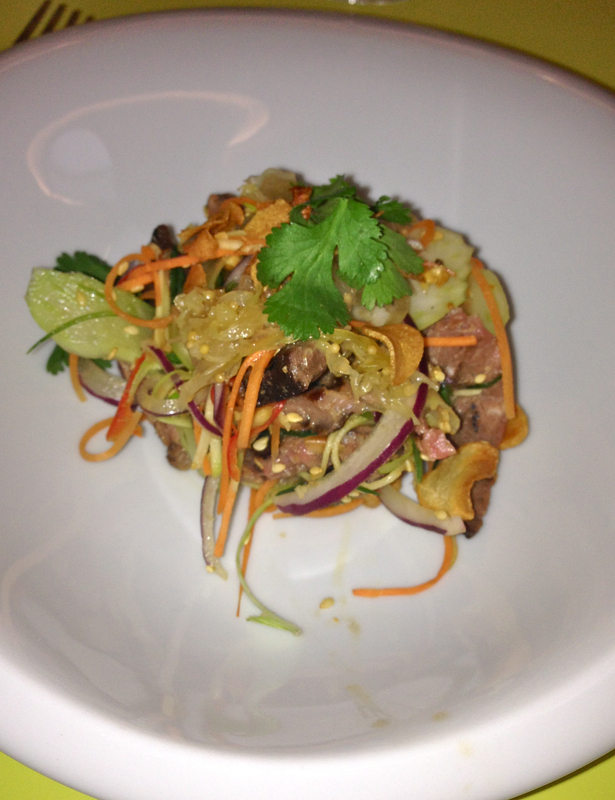 My delectable Thai beef salad starter was packed with punchy Asian flavours mixed into a tasty bundle. The most perfect starter of the year? Quite possibly. The Magazine is in Hyde Park, five minutes from the Serpentine Gallery on the north side of the Serpentine Bridge. When it comes to what I’d call Eating Streets in London, Charlotte Street has got to be the ultimate. I always say that if I didn’t live in London I’d check into a nearby hotel for a week (or possible even two) and make my way up and down the street until I’d tried everything out. There’s so much there. And I’ve discovered somewhere new, too. Obika describes itself as a Mozzarella Bar – and indeed there is a bar at the front where you can sample all sorts of deliciacies. The Mozzarella is made in Campania and flown into London three times a week, so you can be sure it’s fresh. 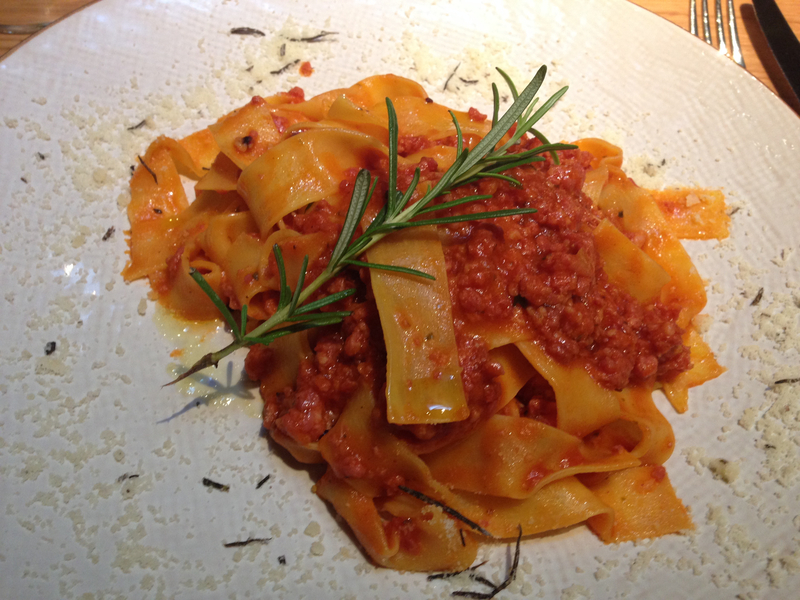 My pasta dish of parpadelle with sausage and tomato ragu was the best pasta dish I’ve had all year. Perfectly cooked, fresh pasta coated in an amazing sauce. I can see myself whiling away many an hour in Obika, which is an international “chain”. Oh and one’s just opened in Poland Street in Soho, I can hear it calling me. Wow, what a fantastic array of dishes I’ve been privileged to sample this year. And that’s just in London. Watch this space, as I feel the need to share with you even more: how about my top-10 from the rest of the world? Coming soon.